Behind the bar, a bespoke promotional device swirls the golden liquid fusion within a Tofka bottle – accentuating the premium values of the brand within the on-trade environment. Each listing is supported with a bespoke device to promote the brand to the consumer at the point of sale. The theatre of the serve has rapidly evolved into a plethora of variances from being served as a shot under shards of grated ice or over ice as a long serve or mixed into coffee or ice cream. Tofka can slip effortlessly into any social occasion and is a truly all-year-round indulgence. The latest addition to the Babco UK portfolio was conceived in Courchevel 1850 in the French Alps and was the best kept secret up until now. Chris Bowen, managing director of Babco UK says, “We see Tofka defining a new category rather than being another player in a crowded one; especially as customers are always looking to experience the next big thing”. 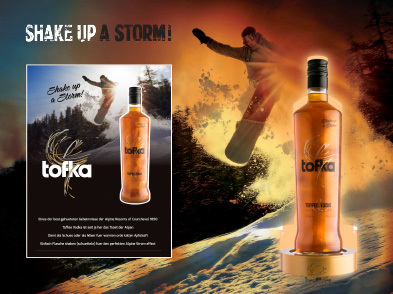 Tofka has been launched into a select number of bars in designated cities around the UK – including most recently at Winter Wonderland in the heart of Central London. Tofka. Pure theatre in a bottle. Go shake up a storm.